Australia is a big and vast country! You will find that driving conditions can differ greatly from one country to another. In Australia, we drive on the left-hand side of the road. When calculating travelling time please remember to take into consideration that you will be required to reduce your speed through the many towns and cities on your itinerary. Please also take into consideration adverse road and weather conditions as this can take up more travelling time. It is important to plan and research your driving itinerary in advance and pay extra attention to driving distances. We recommend that you try and keep to travel around 250 kms a day so you can truly experience Australia and the places of interest at a leisurely pace. You will get to see so much more and enjoy the trip and not be tired from too much driving. You will find many native animals in Australia but they can be very dangerous on our roads. While it is natural instinct to swerve to try and avoid an animal, we suggest you keep the campervan vehicle in Australia on the same line, slow down, and stop if possible. Always look out for any oncoming vehicles when you brake and stop suddenly. Note: It is better to cause minor damage to the campervan by colliding with an animal, rather than with another vehicle or immovable object. Always remember that campervans and motorhomes are 2 times the height and length of normal sedan car. Do keep an eye out for height indicator signs, overhanging tree branches and cantilever awnings. Be very careful when reversing near fixed objects (walls etc.). You can also hire a Satellite phone for your trip (especially if you are travelling in the Outback). The Satellite phone will come in handy as there are many areas of Australia that do not have mobile phone coverage. This will enable you to have coverage in all areas. We recommend Satellite phone as an important safety item for remote travel. Satellite phones hire costs around AU$20 per day plus call costs. Campervans rentals and motorhomes hires in Australia can only be driven on sealed roads (bitumen roads). Exception: you can travel up to 12 kms on well-maintained access roads to recognised campgrounds and Kangaroo Island. All our campervan rentals in Australia offer 24 hour road-side assistance. If you have an incident whilst on the road – please call the toll free number displayed on the campervan. Kitchen Equipment - Your campervan will come with cups, glasses, plates, bowls, forks, knives, spoons, mixing bowls, colander, bottle/can opener, saucepans, frying pans, chopping board, teapot, kettle, toaster, cooking utensils, and tea towel (Note: different vehicles may have different utensils). All you have to do is stock up the fridge at the nearest supermarket before starting your campervan rental. Linen & bedding – You will be provided pillow, pillowcase, sleeping bag, sheet and towel per person with your campervan hire. (Note: some companies may charge for this service). You will also find other useful items to make your holiday easy – broom, dustpan & brush, fire extinguisher, pegs, clothes hangers, biodegradable toilet chemicals, dishwashing detergent, bin liner, bucket & hose, disposable gloves, matches and toilet roll. So what to pack for your motorhome holiday? We have put together a checklist as a general guide for you. Do not worry is if you have forgotten anything as you can always purchase these supplies when you arrive as most branches are located in major cities and towns and there is always a convenience store just round the corner from the branch. 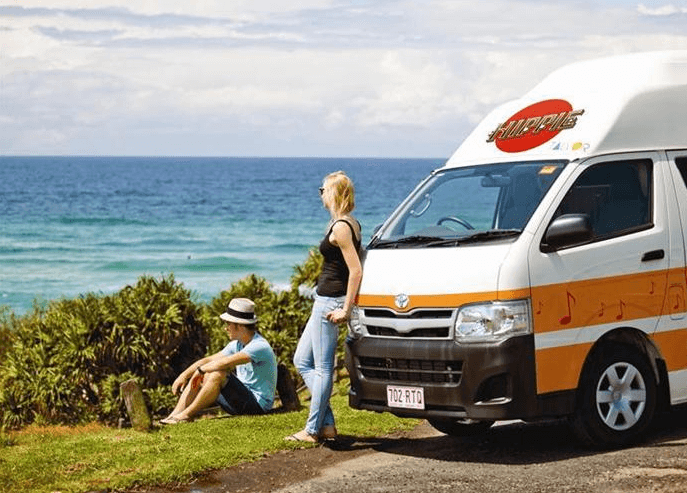 You can purchase any extra items for your Australian campervan holiday at the local supermarket instead of taking up your valuable luggage space! We suggest you pack your gear and clothes in soft luggage bags – they are a lot easier to store in the campervan or motorhome than a hard suitcase. Storage space in the vehicle is limited.